* Results may vary based on each patient’s physical health, diet and exercise, and adherence to the Sadkhin Complex. Before and After photographs displayed on this site are of actual patients who have given permission to have their pictures published. Testimonies have been provided by individual patients. Photos and testimonies are for illustrative purposes only. When I got married in 1998 I weighed 147 lbs. After having two children and two c-sections my weight was up near 200. I tried every diet available. I went to 2 endocrinologists, 2 homeopathic doctors, my primary care physician, my chiropractor, a shaman, and my ob-gyn. I was going to the gym and walking and doing yoga all while cutting my caloric intake down to 900 calories per day. I gained another 32 lbs. 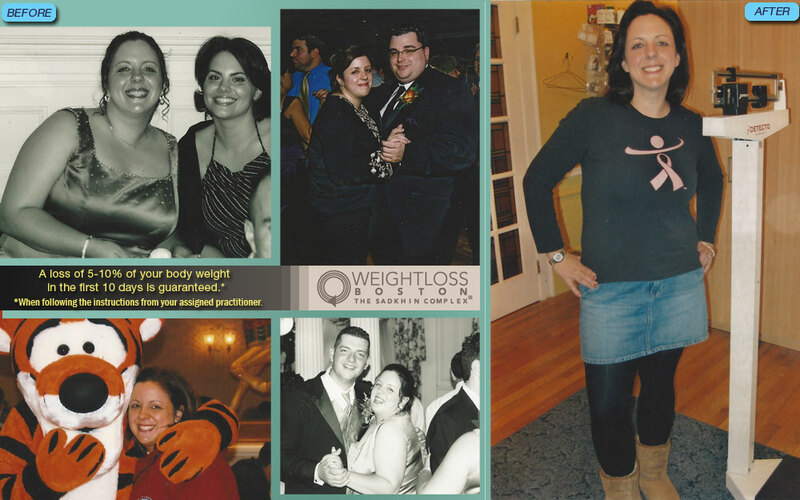 I had just about given up on ever losing weight and I heard about Weightloss Boston. I figured I could try one more time. I met Dr. Nash for the first time on May 2, 2008. I put all my trust in him and the program. I followed everything he said and I did not cheat or deviate at all. I lost 10 lbs in the first 4 days. I thought to myself, “This is great….but it’s probably just water weight.” I lost a total of 14 lbs in my first 10 day cycle. I lost another 14 lbs over the next two cycles. At that point I had lost 28 lbs in 30 days and was almost back down to 200 lbs. I stayed on the program from May 2 until September 2. In that time I lost a total of 68 lbs. In the first 4 weeks my daily headaches were gone and I no longer had to take a daily allergy medication which I had been doing for 20 + years. My cholesterol dropped 110 points in 6 weeks. After going on maintenance, I lost another 9 lbs. Total weight loss was 84 lbs. I was down to almost my wedding weight and in better shape than ever. My primary care physician ran my blood work and said my results had never been better….I was healthier than ever before….my eyes were bright….my skin glowed. smelling food you can’t have works. try it. Veggie soup…..tomatoes, celery, onions, cabbage and green beans. yum. I am always available to chat. My personal email is denyse323@gmail.com. Anyone on the program can email me all the time about anything.